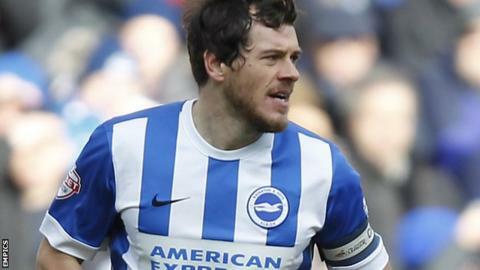 Brighton skipper Gordon Greer says their performance in the defeat by Wigan Athletic was unacceptable. The Seagulls lost 2-1 at the DW Stadium and missed the opportunity to secure their Championship status. "We are at the bottom of the bottom of the league, fighting for our lives and the performance wasn't good enough," the 34-year-old told BBC Sussex. "We were fully aware how big a game and test of character it was. We need to take full responsibility." Brighton went into the trip to Wigan seven points clear of the relegation zone and could have virtually sealed their place in the second tier with victory. Defeat meant the Sussex side are now six points above 22nd-placed Millwall, who have a game in hand. "We wanted to put on a good team display but we didn't do it," centre-back Greer added. "If we had won we would have secured Championship safety, moved on and regrouped for next season. Instead we didn't play well at all. "All season it has been up and down but it was a real bad day and a bad result." Since joining Brighton in 2010 Greer has captained the side to the League One title and helped secure successive play-off finishes in the last two seasons. The Amex Stadium outfit now face fixtures against promotion-chasing duo Watford and Middlesbrough as they bid to avoid relegation. "Over recent years we have had it quite good and played some great football," the Scotland international added. "We have been up near the top of the table but this year we have been down near the bottom pretty much most of the season. "It has been a really difficult season for everyone connected to the club."